There are thousands of former Test cricketers, and as many of them are, as you might imagine, elderly gentlemen, they are slipping off this mortal coil on a fairly regular basis. Such limited research as I have done suggests that around twenty die in an average year, although (touch wood) Arthur Morris, Andy Ganteaume and Norman Gordon continue to defy the Reaper. One can add to their number those players who represented their countries in One Day Internationals, and of course many more who had distinguished careers in domestic cricket but who somehow never received the call. It goes without saying that not all are worthy of special features or their own tribute thread, but they should not, in my view, be overlooked completely. In what I intend to be a regular series I’ll be looking back at the lives and careers of these men and in due course expect to include some non-players as well. Feedback and suggestions are, of course, always welcome. David Allen and John Mortimore, who died within three months of each other, were the Gloucestershire off-spin pair who both represented England. It seems extraordinary today that two spinners, and two of the same type, could play for one county over such a long period – from the early 1950s to the mid-1970s – but they were different enough to complement each other. Allen was a bigger spinner of the ball, Mortimore, a qualified accountant, fittingly the more accurate and probing. Both could bat well – Mortimore, flown out to reinforce Peter May’s ill-fated team in Australia in 1958-59, hit 44 on debut, and five times made over 1000 runs in a season, while Allen, two years younger, who made his first appearance at Bridgetown in 1960, should always be remembered for keeping out Wes Hall in a dramatic final over at Lord’s in 1963. Colin Cowdrey, who had a broken arm but stood watching from the non-striker’s end, has always been hailed as the hero but surely Allen did the more difficult part. Of course, it was a time when the selectors were spoiled for choice for spin options, in marked contrast to today. When Allen and Mortimore started playing for the county they actually had two other spinners on the staff: a third off-spinner in Bryan ‘Bomber’ Wells (who, unable to match them in batting, later went to Trent Bridge) and left-armer Sam Cook. Jim Laker was the first-choice off-spinner for England until 1959, after which Ray Illingworth and Fred Titmus were the men most often preferred. Mortimore’s appearances were few and his returns slight, but Allen did as well as anyone, taking 122 wickets, the same number as ‘Illy’ , in 22 fewer Tests. This year has also seen the passing of two Yorkshiremen, of different generations. Graham Stevenson was a fast-bowling all-rounder who could hit the ball hard, and was seen as the obvious successor to Chris Old – but it didn’t work out that way. He once hit a hundred at number 11 with Geoff Boycott, who he outscored, at the other end. But after a memorable ODI debut at Sydney in January 1980, when he hit a quickfire 28 to win the game after taking four wickets – it seems a travesty that he didn’t get the match award – two Tests came and went, then came injuries, a move to Northants, and his career was over at 31. Phil Sharpe was one of those players, and England seem to have more than anyone, who had a very good Test record (averaging 46) despite playing only a few times. 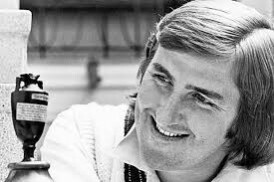 In his case it was perhaps a question of timing – when he made his only century, 111 against New Zealand in 1969 he was already 33; England had no tour that winter, and when Illingworth’s men went to Australia a year later the younger John Hampshire was understandably preferred. Sharpe received no more chances and finished his career at Derbyshire. He was a superlative close catcher, generally in the slips. At Headingley in 1968 Essex’s Keith Fletcher was preferred, and to the undisguised disgust of the locals spilled a number of chances that the aptly-named Sharpe would have taken with his eyes shut. The Gnome was never allowed to forget that. Damian D’Oliveira had to live up to being the son of a famous father, as many cricketers have done before of course. South-African born but brought to live in England with his parents as a young child, he forged a useful career with Worcestershire as a batsman who could bowl, like Basil, medium pace or off-spin. His best year was 1990, the summer of runs, when he made 1263 runs and averaged 38 – he also snapped up 33 catches that season. Latterly he was better known as the county’s coach. Two Test players from overseas also died in the first half of 2014. Ivor Mendonca was a wicket-keeper from Guyana who appeared twice against India in early 1962, a series in which West Indies used three keepers – Jackie Hendriks started the rubber as the man in possession, and David Allan returned for the third and fifth matches. Mendonca did not get another chance despite hitting 78 on debut (albeit in a total of 631-8); his two Tests comprised one-fifth of his first-class career. And of course last but by no means least, the hero of a World Cup semi-final. Gary Gilmour astonished England at Headingley in 1975 by talking 6-14 and following it up with an assured 28* to take Australia to the final, where he took another five wickets. His star was one that shone brightly but briefly though. There was a Test century against New Zealand eighteen months later, but World Series Cricket demanded fitness levels from its players that Gilmour found difficult to attain, and he was denied further opportunities with the national team when the Packer players were restored. I can’t help but think that he was a player out of time – Twenty20 would surely have suited him perfectly. But by 1981 he was out of the game, and his last years were difficult, with well-publicised health problems. Even as I write this piece I note that Peter Sainsbury, a Hampshire stalwart of the 1960s, has also succumbed; however I shall keep him, and perhaps a few other county notables, for next time. The aim is for this to be a quarterly piece from now on.